Pre-war theatre from BBC Television, 2. A previous post started my journey through theatre plays on BBC television in the years 1936-39. Here, I want to look at some of the productions of notable living playwrights in those years, both as they were staged live in the studios at Alexandra Palace and as, in one case, they were relayed from the theatre. Among the long-gone delights are Ralph Richardson in a J. B. Priestley drama and eight (count ’em) dramas by George Bernard Shaw, an author who previously had refused the cinema permission to film all bar one of his plays. In 1998 Neil Taylor wrote a foundational article called ‘A History of the Stage Play on BBC Television’; frustratingly, this is only available in the out-of-print collection Boxed Sets: Television Representations of Theatre, edited by Jeremy Ridgman. In this Taylor totals up the productions (including extracts) between 1936 and 1994 of theatre plays by prominent playwrights. Shakespeare comes out on top, of course, and then the order is Shaw, Ibsen, Priestley, Chekhov, and Coward. In 1939 George Bernard Shaw (d. 1950), J. B. Priestley (1984), and Noel Coward (1973) were very much alive, as were — from the rest of Taylor’s top twenty — Eugene O’Neill (1953), Terence Rattigan (1977), the Scottish writer James Bridie (1951), Somerset Maugham (1965), Bertolt Brecht (1956), A. A. Milne (1956), Harold Brighouse (1958), and farce expert Ben Travers (1980). J. M. Barrie, who makes the list at number 7, died in 1937, and the only significantly younger writer in the twenty, Arnold Wesker, was only born in 1932 (Pinter doesn’t feature). This list seems as good a place as any to begin a first map of televised stage plays by living writers in the late 1930s. But one of the very earliest significant productions was by another major twentieth-century writer better-known as a poet than a dramatist, T. S. Eliot. Less than a month after regular television transmissions started on 2 November 1936, there was an afternoon presentation of scenes from Eliot’s Murder in the Cathedral. The production was running at London’s Duchess Theatre, and had been first staged by E. Martin Browne in the Chapter House at Canterbury Cathedral during the previous year’s Canterbury Festival. Scenes were transplanted to the tiny studio at Alexandra Palace and played there by a cast of five, including Robert Speaight, who made his name with his Thomas Becket in this production, and Browne as the Fourth Tempter and Knight. 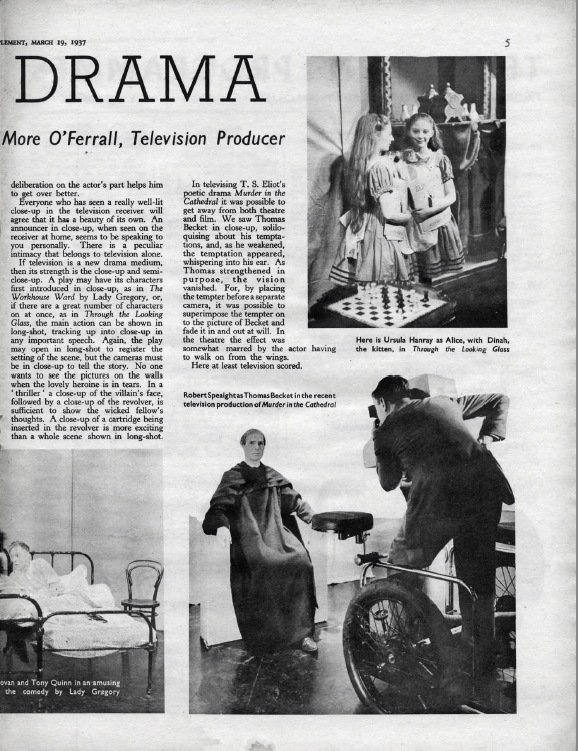 The television producer was George More O’Ferrall, who was responsible for many important early dramas. 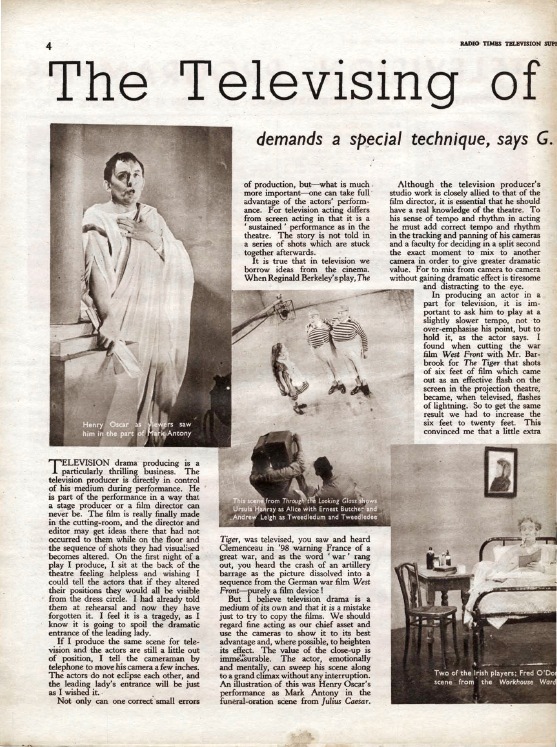 He also wrote, in a March 1937 Radio Times feature titled ‘The Televising of Drama’, probably the first critical comparison by a practitioner of the differences between the theatre, cinema and television. In televising T. S. Eliot’s poetic drama Murder in the Cathedral it was possible to get away from both theatre and film. We saw Thomas Becket in close-up, soliloquising about his temptations, and, as he weakened, the temptation appeared, whispering into his ear. As Thomas strengthened in purpose, the vision vanished. For, by placing the tempter before a separate camera, it was possible to superimpose the tempter on to the picture of Becket and fade it in and out at will. In the theatre the effect was somewhat marred by the actor having to walk on from the wings. How He Lied to Her Husband, written more than thirty years ago, is the only play that Shaw has allowed to be seen in the cinema. The film was directed by Cecil Lewis, who, before going to Hollywood for the filming of his war book, was a television producer. Remarkably, there exists a tantalising tiny fragment (11 seconds, 3 shots, mute, and in colour) of the staging of this production. This is available courtesy of the Alexandra Palace Television Society’s YouTube channel here. Shaw seems to have enjoyed the experience of having one of his plays televised, not least because a photograph of the three characters at the end of the year is described as having been ‘posed’ by him. Then in the 1 July 1938 edition of Radio Times, the magazine’s correspondent ‘The Scanner’ reported as follows. Monday’s production will be the second Shaw play to be televised … Androcles and the Lion will be given uncut—a condition demanded by Shaw. Esmé Percy, who is to play Androcles, was once general manager to Charles Macdona’s Bernard Shaw Repertory Company, and has played the part many times. The Times was enthusiastic in its response. Androcles and the Lion was televised with conspicuous success last week. Any play which relies on dialogue for its effect is excellent television material, and no points in Mr Shaw’s delightful fable were missed … The casting of this play was striking and almost suggested that the author had had a hand in it … The scene in the arena was well-staged by the simplest means, and the reunion of Androcles and the Lion most touching, as Mr Percy played the part of Christian-about-to-be-eaten with absolute sincerity. The following year, on 26 February, Shaw’s The Dark Lady of the Sonnets was also given, with the great Helen Haye as Queen Elizabeth and Henry Oscar as Shakespeare. Angela Baddeley, twenty-four at the time and, much later, Mrs Bridges in Upstairs, Downstairs, played the Dark Lady. Nor was the BBC finished with GBS, for on Bank Holiday Monday in April 1939, the entire evening’s transmission (that is, from 9-10.30pm) was occupied by a production of Candida, starring Marie Ney and Julien Mitchell. And later in the month Act 3 of Shaw’s Geneva was relayed as an outside broadcast from the St James’ Theatre. Rounding out what must have felt like a Shaw spring was the playwright’s short drama Annajankska, the Bolshevik Empress on May 3. ‘The Scanner’ carried a little footnote in the following edition of Radio Times. Ever since he appeared in the television studio for the broadcast of How He Lied to Her Husband, GBS has been very kindly disposed towards Alexandra Palace. When Shaw was asked to write a synopsis of the first two acts of Geneva, he agreed readily, sending in his copy with a note saying ‘ You can adapt this to your own turn of speech if it comes awkwardly’. The one thing he refused to do was to speak the synopsis himself—one of the reasons he gave was that he did not want to do an actor out of a job. There were two further Shaw productions before, in September, the war closed down these early television transmissions: Passion, Poison and Petrification on 9 June and his ‘trifle’ The Man of Destiny, with regular Henry Oscar as Napoleon, on 20 July. After the Napoleonic trifle, the critic of The Times returned on 24 July to the theme he (presumably) had introduced in the earlier review, above, of Androcles and the Lion. All these plays [by George Bernard Shaw] were highly successful in the new medium, which demands good dialogue; but never did those long speeches seem more to the point than in The Man of Destiny. On the stage on such occasions the action is held up, the supporting cast droop, and everything goes into slow motion, but on the screen the speaker goes into ‘close-up’, viewers are galvanized into concentration, and everyone else on the set can drop conveniently out of sight. Mr Shaw, with his uncanny prescience, has been writing television plays for years without knowing it, and we are only now reaping the benefit. Discussion of productions of works by most of the other living playwrights in the 1930s will have to wait for a later post, but it’s interesting to compare the presence of dramas by J. B. Priestley with Shaw’s near ubiquity. The first listing is for ‘scenes from’ Spring Tide on 18 February 1938. This comparatively obscure drama from 1936 was co-written by Priestley with George Billam, and intriguingly Priestley initially released it under the pseudonym Peter Goldsmith. Louise Hampton and Arthur Sinclair starred, just as they had in the premiere production at The Duchess Theatre in 1936. An earlier Duchess Theatre production of Laburnam Grove, from 1933, was adapted for television by Michael Barry who produced the presentation on 4 August 1938. (Carol Reed had already directly a cinema version in 1936.) On 2 November that year Priestley himself appeared on the screen, giving a speech from the Alexandra Palace studios as part of the Television Festival Dinner of the Royal Photographic Society which was in fact being held at the Dorchester Hotel. On an occasion held to mark the second anniversary of regular television transmissions, Priestley’s after-dinner remarks were transmitted to the Dorchester and to the nation (or at least those within about thirty miles of the transmitter), and were followed by a cabaret featuring, among others, Gracie Fields. Three cameras were set up in St Martin’s Theatre and succeeded in presenting viewers with a complete version of Mr Priestley’s Yorkshire comedy When We are Married. One camera, operated from the front row of the dress circle, covered about two-thirds of the stage, and the other two, railed in on platforms at opposite ends of the orchestra stalls and resembling anti-aircraft searchlights, contrived with changes of lens the frequent ‘close-ups’. The experiment, to the non-technical unexacting eye, was surprisingly successful. A great deal of detail was lost … speakers now and then disappeared and disturbingly reappeared in unexpected places … But these were trifling defects to set against the rather awful fact that last night for the first time in a London theatre proper, it was possible to follow the play and enjoy a large measure of its fun from the bar. It would not seem, however, that the theatre has at present much to fear from television. Those who found it a strain upon the eyes to follow the farce act by act and went into the auditorium were in a position to judge the difference between what Mr Basil Dean, in a curtain speech, called ‘the magic of human personality’ and its black and white shadow. The actual stage seemed to be bursting with life and colour. At the end of 1938, on 9 December, Priestley’s Cornelius was presented from Alexandra Palace, and early in the new year, on 11 January, Ralph Richardson starred in the playwright’s ‘farcical tragedy’ Bees on the Boat-Deck. Five televised dramas, then, in these early years, as against Shaw’s eight. But the When We Are Married broadcast was clearly a milestone in the medium’s development, and so the honours can be regarded as fairly evenly shared. Next time, I’ll explore productions of dramas by Noel Coward, Eugene O’Neill, Somerset Maugham, and others. This post was originally written for the Illuminations blog and first published here on 3 July 2010. « Pre-war theatre from BBC Television, 1.